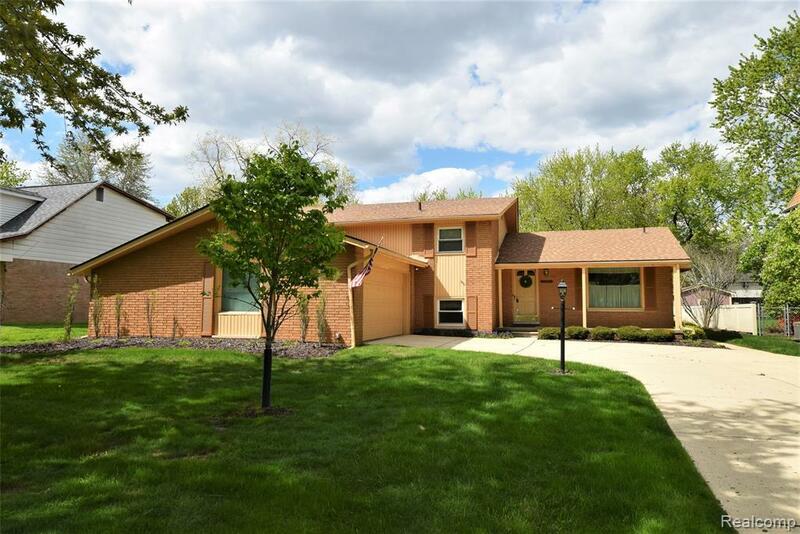 Beautifully-maintained brick Grosse Ile home! Enjoy: four bedrooms, 2.5 baths, large living room with open dining room, updated kitchen with elegant cabinetry, double oven, refrigerator, stovetop, dishwasher all stay, three bedrooms up, including a master with attached bathroom, plus another full bathroom, lower level with family room that includes a gas fireplace with brick wall and Vermont slate, doorwall to covered patio, half bath. Basement underneath the lower level has a finished bonus room laundry room, and pantry. The backyard has vinyl fencing, large shed with electricity, and a wonderful assortment of perennials. The side-entrance attached garage has 530 square feet, plus an opener and keypad entry. Important extras include a French tile drain system on both sides of the backyard, plantation shutters, newer roof (2014) that was stripped to the wood, long driveway, upper central air in 2016, gutter guards, thermostat-controlled exhaust fan in the attic, and One Year Warranty. IDX provided courtesy of Realcomp II Ltd., via MBA REALTY GROUP INC and Realcomp Ii Ltd, Copyright 2019 Realcomp II Ltd. Shareholders. Real Estate listings other than those of MBA REALTY GROUP INC are marked with the Broker Reciprocity logo and detailed information about them includes the name of the listing brokers. Information deemed to be reliable but not guaranteed. Any use of search facilities of data on the site, other than by a consumer looking to purchase real estate, is prohibited. Last updated on 2019-04-24.